Krotoa (known as Eva to the Dutch and English settlers) was the niece of Autshumao, a Khoi leader and interpreter to the Dutch (he was known as Harry/Herry first by the English and then by the Dutch). A young Krotoa, of about 10 or 11 years old, was taken in by Jan van Riebeeck during the first few days of Dutch settlement in the Cape. She worked as a servant to the Commander’s wife, Maria van Riebeek (nee de la Quellerie), and is first mentioned in van Riebeeck’s diary in January 1654 as ‘a girl who had lived with us’. She mastered Dutch and Portuguese and responded eagerly to Christian instruction given her by Maria. As her command of the Dutch language and her familiarity with Dutch ways grew, so did her usefulness as an interpreter. Krotoa established herself as a staunch friend of the Dutch, negotiating a co-operative relationship between the fort and the followers of her rich relative Oedasoa. She was later instrumental in working out terms for ending the First Dutch-Khoi-khoi War. In the 1650s Eva was the only figure possessing an intimate knowledge of both Khoikhoi and Dutch culture; as she passed back and forth between one society and the other, she exchanged her Dutch clothing for Khoikhoi skins, and vice versa. However, her work as an interpreter was not easy at this time, as she was torn between her loyalty to the Dutch (who had taken her in and given her new clothes) and her own people (whose land was being taken over by the Dutch in the late 1650s). Due to this dilemma, Krotoa often struggled to maintain trust on both sides. This struggle is evident in a report by van Riebeeck’s diarist, who recorded the words of the Khoi chief and interpreter, Doman: ‘I am a Hottentot and not a Dutchman, but you, Eva, try to curry favour with the Commander [van Riebeeck].’ Doman therefore saw her as a traitor. Yet van Riebeeck, who understood that Krotoa was the niece of the Goringhaicona Chief Autshumao (Harry), felt she was overly devoted to her uncle. Ironically it was according to Krotoa’s advice (supported by Doman) that van Riebeeck once had Autshumato captured and sent to Robben Island. In 1662 Krotoa became the first indigenous Southern African to be baptised a Christian, and the Dutch settlers named her Eva. But in the same year, the van Riebeeck’s departured the Cape leaving Krotoa feeling vulnerable. She was recommended to van Riebeeck’s successor, Wagenaer, but the new Governor was suspicious of her. This was partly because of the fact that she left to visit her people from time to time. Life was also extremely hard for Krotoa after the deaths of both Autshumato and Doman, as she remained the only experienced go-between at the Cape. On 26 April 1664, Eva’s engagement to Danish soldier and explorer Pieter van Meerhof was announced. The announcement came three months after van Meerhof’s sixth expedition into the interior. The couple were married on 2 June 1664, at the house of Commander Zacharias Wagenaer. 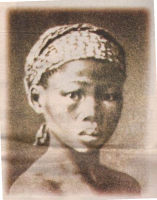 The Company (VOC), which favoured total cultural assimilation for Khoikhoi, gave her a generous dowry. The keeper of Wagenaer’s diary noted that this union was “The first marriage contracted here according to Christian usage with a native.” As it was only 12 years after van Riebeeck’s landing at the Cape, marriages between Whites and Natives were not prohibited at this time. One year later, Eva, van Meerhof and their 2 children went to live on Robben Island, where van Meerhof was appointed superintendent. His job was to get rid of snakes, spiders and similar creatures. When Krotoa, who gave birth to her third child in 1666 - the family briefly returned to the mainland to baptize the baby. Later, on an expedition to Madagascar, Van Meerhoff was killed in a skirmish. Krotoa and her children returned to the mainland in September 1668. For a while Eva remained a respectable member of European society, but soon start­ed to drink heavily and turned to prostitu­tion. In February 1669, her drunken behaviour at the dinner table of Commander Wagenaer, and her increasing bitterness against the settlers, prompted a warning from the Dutch that if she did not correct her ways, she would be banished. Krotoa decided to abandon her children and run away, but she was soon taken back to the fort as a prisoner. In March 1669 she was banished to Robben Island for immoral behaviour. She died on the Island 5 years later on 29 July 1674, and was buried the next day in the church of the new Castle. Eva’s youngest children, Pieternella and Salamon, who were from her marriage to von Meerhof, were taken to Mauritius in 1677 by a man named Bartholomeus Born. Pieternella later married free burgher Daniel Saayman and had four sons and four daughters- the second daughter named Eva after her grandmother. Pieternella and her family returned to the Cape in 1709. Little is known about the lives of Pieternella’s brothers and of the children that Krotoa bore out of wedlock. • 'Islands' by Dan Sleigh (Secker and Warburg, 2004) "Translated from the original Afrikaans version by Andre Brink, drawing on the early Dutch East Indies Company journals, archival researcher Dan Sleigh reads between the lines of official entries and creates a fictional voice for Krotoa". • Groep Sonder Grense - Die rol en status van die gemengde bevolking aan die Kaap' by Hans Fredrich Heese. For those interested in geneaology and the complexity of Coloured identity in South Africa. • Morris, M. (2004) Every Step of the Way: The journey to freedom in South Africa. Funded by the Ministry of Education. Published by HSRC Press, p 62 ”“ 64. • Giliomee, H. and Mbenga, B. (2007). New History of South Africa. Tafelberg Publishers, Cape Town, pg 51. • ‘The Leader’ (date unknown) Supplement series in The Sowetan.